“The reasons for not doing it heaped up and up and up.” Most people would survey that heap and stop right there. Not so Anna Watkins, who partnered Katherine Grainger to win one of Great Britain’s most celebrated gold medals in the double sculls at the London Olympics. She is of the breed, often elite athletes, who see obstacles as stepping stones. They’re called “mentally tough” in the business. Often crazy or (more politely) bloody-minded in the wider world. “So gradually the reasons not to do it became the reasons to do it. It wasn’t following the rule book. It was completely untested. No one’s done it before. But that’s what got me excited. I have no idea whether I’m going to be fit enough to seriously defend my Olympic title or not. So that’s the brief. Leave the sport, have two little boys – William and Richard – 17 months apart, all the requisite sleepless nights and darting around parks with a pram, and once you’re in absolutely, utterly uncharted territory 12 months out from Rio, decide to stick your oar into sport again. Not just any sport. But the pinnacle of Olympic competition. Watkins laughs a good deal in discussing her plans, but this is a razor-sharp deduction from a woman with a scientific bent and a PhD in Maths. It’s an experiment on herself for sport, for family life, for womankind. She wouldn’t put it that grandly. In her mind it’s the turning of a “tiny little temptation”, as she puts it, into something that might or might not be a success. It happened because she wanted to get fitter after having her second son Richard. “I started doing just half an hour a day in the gym because it was my treat, my escape. It was a chance to clear my head. Being home with two very young children, one wrapped round my legs and the other in my arms, was pretty tough as well as wonderful. “But it’s dangerous having time to think. And thinking happened in my case when I was sitting on the rowing machine or going for a run. ‘I wonder how fast it would come back if I really tried. Then Jess Ennis came back to performing after having her son Reggie and the shape she was in boosted my confidence. That little worm of an idea burrowed right into my head. ‘It’s just a year. Just do it. See what happens’. “I don’t feel under pressure. If it all goes disastrously wrong, hopefully we’ve learned something for the next person to try. And who knows it might go right? My motivation is completely different this time. In 2012 winning that gold medal was about validating the fact that I’d done nothing for 10 years but row. I now know that at the peak of my physical condition I’m capable of winning a gold medal. I’m not answering that question any more. This is more of an experiment on my body. “I have spoken to Katherine. It’s a little bit tricky. The World Championships are coming right up where she’ll be competing with Vicky Thornley, who is the best sculler in the team this year. I have to be hugely respectful of that. I can’t go and discuss my plans with Katherine while she has to focus on that. I did quiz her, though, a while ago. I told her I was thinking about it and asked her all sorts of questions about her training after taking a while out of the sport. She’s really positive about it. But I appreciate the situation is a little bit delicate. The thing with rowing is that when it comes to Olympic trials, no prisoners are taken. It’s a ruthless culling, as anyone will remember after watching the BBC documentary about Sir Steve Redgrave gearing up for this fifth Olympics at Sydney 2000. Then just plain “Steve”, diabetic and 38, he’d take himself to the brink of collapse – and beyond – just in training. Four times a gold medallist but no special favours, even for him. “It is brutal,” acknowledged Watkins. “It hasn’t escaped my attention that if I get in the team, then somebody else wouldn’t be in the team. I certainly won’t get a place on sympathy and enthusiasm. “I’m aiming to join in with what the squad is doing after the World Championships. There are many challenges. I’m not going to go home each afternoon after all the training and turn into Mary Poppins. And I won’t get the quality of recovery I used to have either. I’m sure there will be nights when I don’t get much sleep. I’ve got two children under two. It’s going to happen. ‘But my husband is very supportive. He knows the kind of woman he married. For me to be myself, I have to have projects and goals. He knows that while I was at home with the children – even though I enjoyed loads of it, of course – it wasn’t my natural forte. There were aspects I struggled with. He could see there would come a time when I had to get my teeth into something again. When you haven’t had a proper conversation with anyone in weeks, and haven’t had more than three hours sleep in a block, you feel like your brain isn’t functioning. It gets to you. “You have this whole other version of yourself that you remember from not very long ago. Doing things, meeting people, having something to talk about other than nappies. For me, I’m a better mother, a happier mother, if I’m not at home all the time. “So we have decided to have a nanny at home because we’ll need a third parent really as we’ll both be working full-time. But then there’s the training camps out of the country. That was almost too big a question to even ask. I knew what would be acceptable to me was so far from the norm for the rowing squad. So what we’ve agreed is that I’m not away from the children from more than a week at a time. And if I make it to Olympic camp next summer, I’ll take the children with me, and husband or my mum. “I’m really impressed with British Rowing being so flexible. For them as well this is a bit of an experiment to see how it works. Of course, I’m not going to get the same quality of training as I did before. But the question is: will it be enough? So the side-effect of one woman’s attempt to make the Rio Olympics could become a culture-shifting move that makes us reassess how to best integrate mothers who want to resume their careers at the highest level. The classic ‘assume the pinny and rock cake-making position’ is long gone. In terms of sport, Paula Radcliffe juggled daughter, son and distance running, but never attained her previous heights. Watkins wants to see how far she can go. In that sense, is breaking new ground. “People have fought for generations to give women choices, so now it seems reasonable for me to crack on with my career with young children and see what happens. For hundreds and hundreds of years, women didn’t have a career to start with, let alone be able to do what I’m doing. I just think I am so lucky. “Getting older and having children shouldn’t mean the scales fall from your eyes and you discover that everything you thought was possible as a young woman perhaps isn’t. I know that happens now. When you have children everything gets a bit real. Resuming a career isn’t always possible. Someone’s got to be there for the school run. I’d like it very much if in future, when women reach that stage, they see a way through. Sue Mott is an award-winning sport journalist who has worked on radio, TV and the written press. If you enjoyed this article, subscribe to the mixed zone and get free updates by email. Please feel free to republish this article with credit to www.themixedzone.co.uk by Women’s Sport Trust. Images on our site may have licensing restrictions. If you would like to use the photo featured in this article please contact David Crump at the Daily Mail. 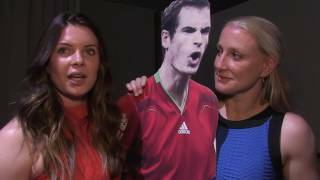 Andy Murray on His Female Spor..
Tamara Taylor & Abbie Scott on..
Where are all the women’s faces?